Police have recovered firearms, explosives and a cache of ammunition at the home of Stephen Paddock, the man who killed 59 people in a mass shooting in Las Vegas. 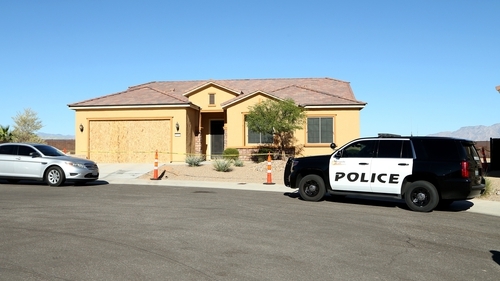 Sheriff Joseph Lombardo said officers searching the house in Mesquite, Nevada recovered "in excess of 18 additional firearms, some explosives and several thousand rounds of ammo, along with some electronic devices we're evaluating at this point." US President Donald Trump has described the attack, in which more than 520 injured, as an "act of pure evil". Mr Lombardo confirmed that the death toll has risen from 58 to 59, and the number of injured stands at 527. The gunman began shooting from the 32nd floor of a hotel during a country music festival for several minutes, before taking his own life. In a televised address to the nation, Mr Trump said that he will travel to Las Vegas on Wednesday. He said: "Last night a gunman opened fire on a large crowd at a country music concert in Las Vegas, Nevada. He brutally murdered more than 50 people and was an act of pure evil." The death toll makes the attack the deadliest mass shooting in modern US history, eclipsing last year's massacre of 49 people at an Orlando night club. A statement by the so-called Islamic State militant group claiming responsibility has been rejected by the FBI. The FBI said that there was no evidence so far linking the gunman to any international terrorist group. About 22,000 people were in the crowd when the man opened fire, sending thousands of panicked people fleeing the scene, in some cases trampling one another as law enforcement officers scrambled to locate and kill the gunman. Shocked concertgoers, some with blood on their clothes, wandered the streets after the attack. Police said the suspect was a local 64-year-old Las Vegas man Stephen Paddock, and they had no information yet about his motive. Paddock took his own life before police entered the hotel room he was firing from in the Mandalay Bay Resort and Casino, Mr Lombardo told reporters earlier. 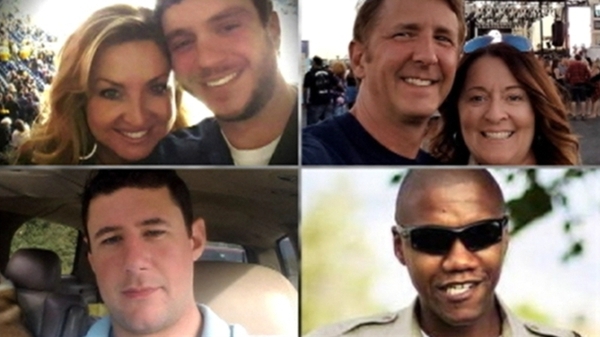 Earlier reports indicated that Paddock, who had more than ten rifles in his hotel room, had been shot by police. The Las Vegas sheriff has said an additional 18 firearms and explosives were found in Paddock's house in Mesquite, Nevada. He was not believed to be connected to any militant group, Mr Lombardo told reporters. "We have no idea what his belief system was," he said. "We've located numerous firearms within the room that he occupied." Authorities had earlier regarded Paddock's roommate, Marilou Danley, as a person of interest. However, they later said they no longer regarded her as related to the case, CNN and Fox News reported, citing police sources. The dead included one off-duty police officer, Mr Lombardo said, adding that police are still finding people who had taken cover during the attack. "It's going to take time for us to get through the evacuation phase," he said. Police had located two cars that belonged to the suspect and, also said that rumours of other shootings or explosives such as car bombs in the area were false. Video taken of the attack showed panicked crowds fleeing as sustained rapid gunfire ripped through the area. "It sounded like fireworks. People were just dropping to the ground. It just kept going on," said Steve Smith, a 45-year-old visitor from Phoenix, Arizona, who had flown in for the concert. He said the gunfire went on for an extended period of time. "Probably 100 shots at a time. It would sound like it was reloading and then it would go again," he said. People were shot and trying to get out. A lot of people were shot. We have no idea. We're horrified. We're bewildered and our condolences go out to the victims. "We have no idea in the world." Earlier, Mr Trump offered his condolences to the victims via a post on Twitter. "My warmest condolences and sympathies to the victims and families of the terrible Las Vegas shooting. God bless you!" Mr Trump said. Las Vegas's casinos, nightclubs and shopping draw 3.5 million visitors from around the world each year and the area was packed with visitors when the shooting broke out shortly after 10pm local time (5am Irish time). Taoiseach Leo Varadkar has said that everyone is horrified by the attack in Las Vegas and he extended condolences and sympathies to those affected. Minister for Foreign Affairs Simon Coveney said he had no indications to suggest that any Irish citizens have been caught up in the attack. However, Minister Coveney said that the Department of Foreign Affairs, through the Consulate General in San Francisco and the Honorary Consulate in Las Vegas, are continuing to monitor the situation. Any families in Ireland who have concerns about relatives who may be in the Las Vegas area can contact the department's Consular Assistance Unit on 01-4082527.